Heat a pot of water to boiling on the stove. Add the julienne-cut jicama and blanch for two minutes. Drain immediately and rinse with cold water. Combine the jicama, red pepper, red onion and apple in a large bowl, tossing well to combine. Whisk together the lime juice, zest, olive oil, ginger, garlic, salt and pepper. Pour over the jicama mixture and toss well. Hello, Jicama! Are you familiar with this bulbous, (some would say) ugly vegetable found in Latin markets and some grocery stores? Pronounced “hee-kuh-muh”, Jicama is a root vegetable that belongs to the legume family. Its raw texture is a cross between a raw potato and a water chestnut, and it can be stratchy. The flavor is subtle, and can be underwhelming if not seasoned well. If you are trying it, I encourage you to taste it before proceeding. It can be eaten raw, and many people do. If you find it to be a little too starchy, try rinsing the cut pieces in water or blanching for two minutes. I typically blanch it, rendering the jicama a little more tender while retaining the crisp texture and faintly sweet flavor. And when I say faint, I mean F-A-I-N-T. So, what can you do with jicama? It works in stir-fries, soups, salads and more. One of my favorite dishes with jicama is my citrus-y Jicama Salad. 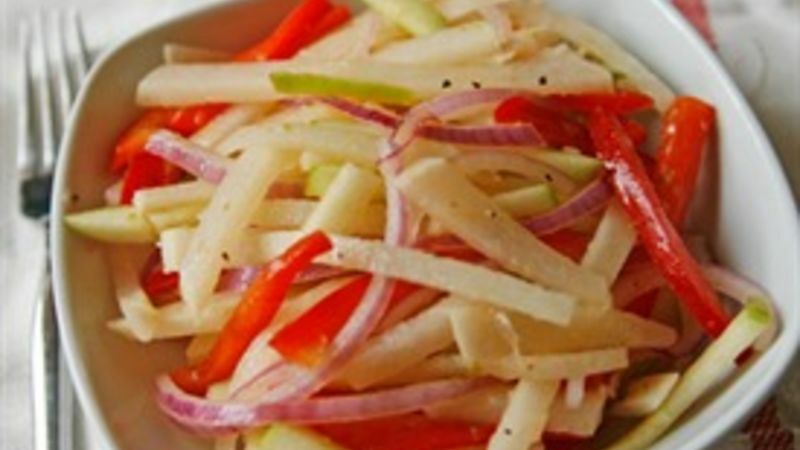 The salad pairs crunchy jicama with tart granny smith apples, sweet red bell peppers and peppery red onions. On top, a lime-ginger-garlic dressing. Serve it with grilled chicken, tacos or just eat it alone. You can also toss in a couple of handfuls of prepared black beans too, to add a little protein. Any which way, it’s delicious!